I could actually stop writing this right now, and just leave you with that, but then you'd be all, "Where's the chip and queso recipe, Jackie?" SO I guess I'll keep going. I could easily eat tortilla chips and queso every day. Maybe even with a margarita. I was looking for a snack one day and saw a good looking sweet potato. I thought to myself, "I'm going to make some chips...but I want a dip to go with it. Hm...what type of dip goes with sweet potato??" And then it dawned on me. I make a sweet potato and chipotle soup...so naturally, a chipotle queso would marry really well. Right? Right! This is an easy recipe that is a crowd pleaser. Perfect for game day, poker night, holiday entertaining, or a late night snack. 1 Large organic sweet potato, sliced with a mandolin about 1/8" thick, if you don't have a mandolin, slice them very thin. If your sweet potato is not organic, make sure you peel the skin. If it is, you can leave it on. Preheat the oven to 250 degrees. 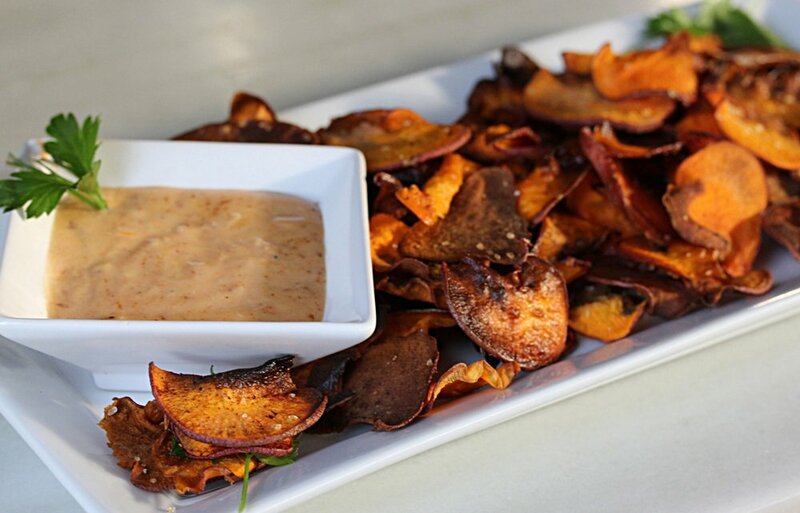 Place the slices of sweet potato on a pan that is sprayed with non stick spray. Spray the tops of the chips as well and sprinkle liberally with coarse sea salt. Cook in the preheated oven for 20-30 minutes until slight browned and crispy. Place on a platter. In a skillet over medium low heat, melt the butter. Add the flour to make a roux and whisk until lightly golden in color. Add the cumin, salt, and chili powder and whisk with the roux. After about a minute, slowly whisk in the milk, a little at the time, making sure to whisk the lumps out. Bring to a low boil and allow the milk to get thicker. Add the chopped american cheese and whisk to combine. Remove from heat and add the chipotle in adobo sauce. Pour into a bowl and serve immediately with the chips.